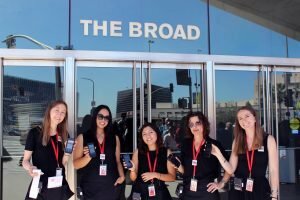 Prior to opening The Broad, Rich Cherry collaborated with internal museum staff and a mobile tour company to develop Ticketure to fundamentally re-imagine ticketing and admissions. Growing out of a need to reduce the lobby footprint of the admissions desk and queue, Cherry envisioned a fully mobile timed ticketing experience where tickets could be purchased within the museum mobile app or thru a simple online interface, the queues moved outside and the Visitor Services staff worked the admission and standby line with mobile devices and ticket printers like any popular attraction. The Broad’s priorities were ease of use, interoperability, flexibility and a SalesForce backend. Their goal was to build something that could be used without an admissions desk. The result was an iOS app-based admissions system, which allows museum staff to easily find, sell, print with mobile receipt printers, and scan visitor’s tickets while enjoying the personable atmosphere of an Apple Store-style interaction. 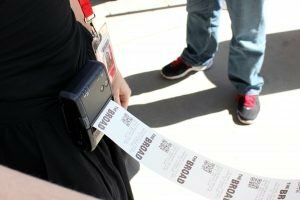 After making advance reservations online or through the mobile app, visitors with The Broad’s public mobile app were encouraged to sign into their accounts and access their tickets directly within the app, like a mobile boarding pass. Visitors already signed into the mobile app were prompted as they arrived at the door to pull up their timed-entry tickets for easy admittance. Museum staff uses an internal-facing app to scan, retrieve, sell, and print tickets on the fly. The emphasis is on efficient, low-friction interactions with visitors, enabling quick entry procedures without any infrastructure but stations. From the visitor’s perspective, the only requirement was one account with the museum, which they could use to purchase tickets and sign into the museum’s mobile app (also produced by Ticketure). 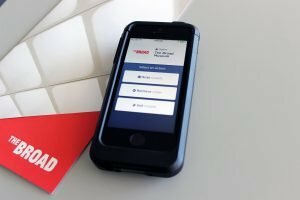 When visitors arrived at the museum, they could present a printed copy of their ticket, pull up their ticket in their email, or follow a prompt to access their ticket directly through the mobile app. Alternatively, visitor services associates could quickly and easily help visitors who had forgotten or lost their tickets by searching for a reservation by name, email, or order number and print tickets immediately. User and ticket data are captured in real-time through a Ticktiture API to Salesforce integration… giving the museum the ability to build custom reports and the ability to use existing integrations to create email blasts and to create quick forms for special case engagements like VIP RSVP forms. Since the museum opening in 2015, the system has processed more than 4 million ticket transactions.